Homemade pizza night is such a fun night at our house. And it can be any night of the week and should not be intimidating. Pizza dough really does come together quickly, and there are so many ideas and versions. Last year I shared a list of different pizza recipe ideas to give you some nontraditional options for pizza night. My kids really enjoy making their own individual pizzas. 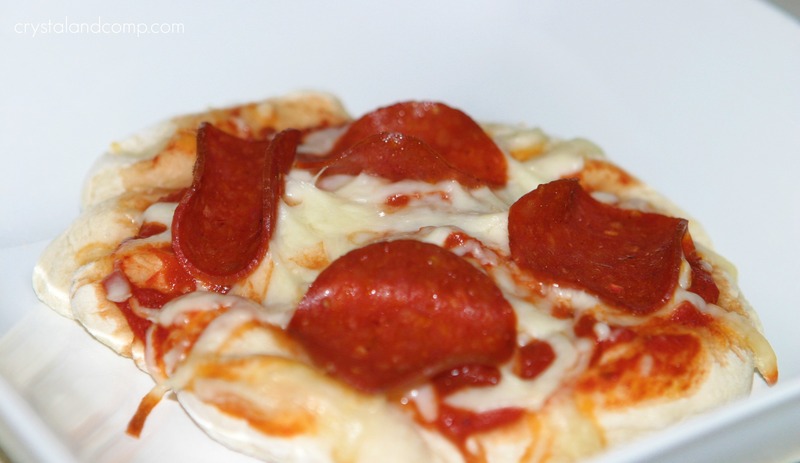 It is a great way to allow them to customize their own dinner, although they all end up making a cheese or cheese and pepperoni pizza. Nonetheless, they all get to be independent and create. Everyone likes that. And, personal size pizzas cook really quickly. 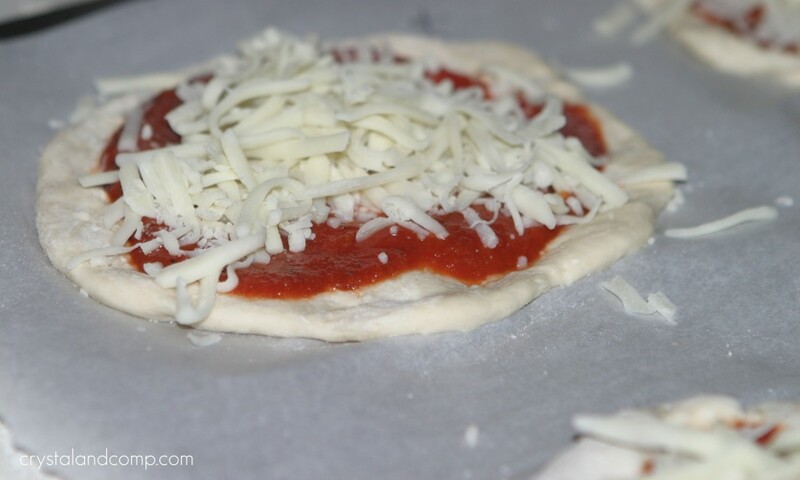 For the homemade pizza crust, I use the recipe on Fleischmann’s website. Add the yeast, sugar, salt, oil and 1 cup of flour to your mixer. Add the warm water and mix until it starts to ball together. Slowly add enough of the remaining flour to soften the dough, it will still be sticky. Knead for a few minutes until dough is no longer sticky. About 3-5 minutes. Leave it alone for about 10 minutes to rise a bit with the quick acting yeast. 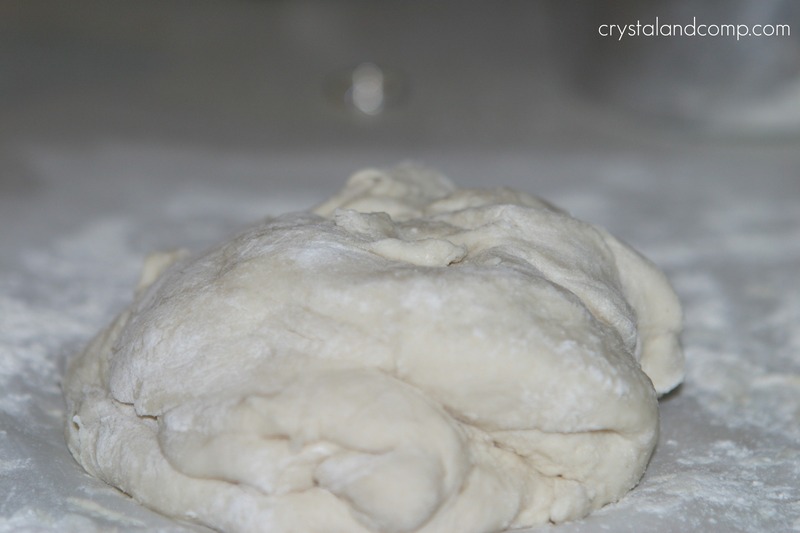 Pull the dough apart into smaller sections. I can get 5-6 personal size pizzas from one pizza dough crust recipe. 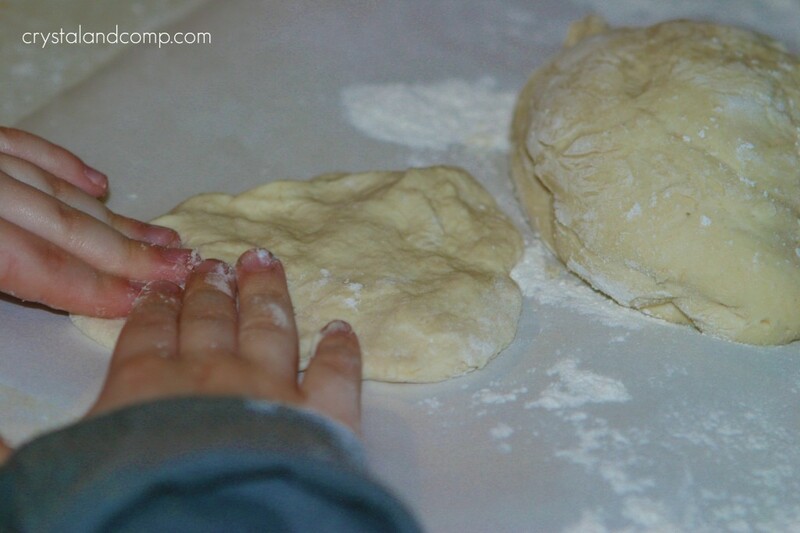 Let the kids shape their own pizza with their ball of dough. 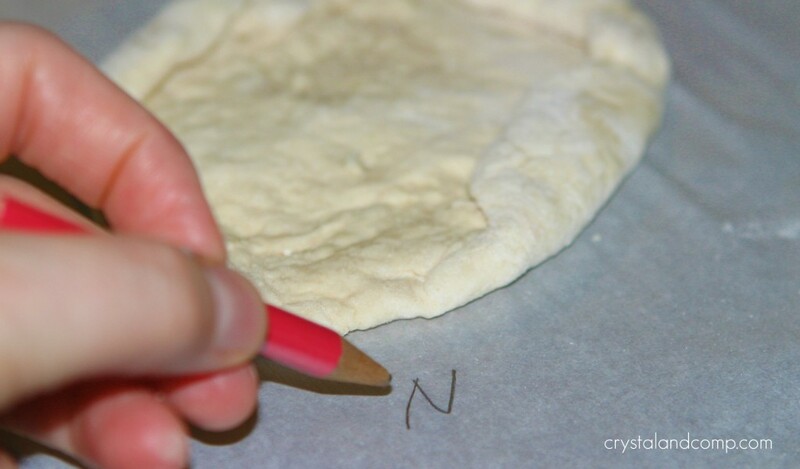 I like to use a pencil to leave the initial of each person so we know which pizza is which. Nicky likes to turn the edges of his crust upward to form a crust like a commercial type pizza. No one taught him this. Totally cracks me up! 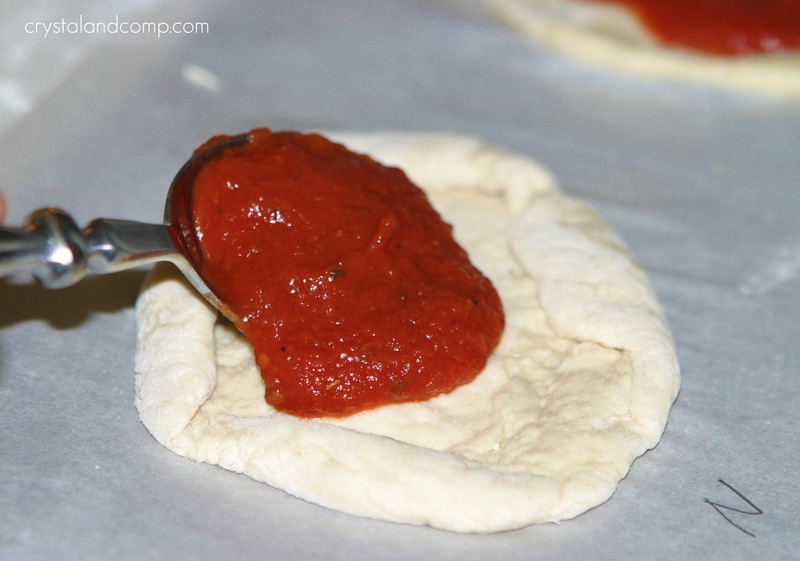 Add a few spoonfuls of your favorite pizza sauce. Add your favorite toppings. My kids stick with cheese or cheese and pepperoni. What can I say, we live life on the edge. Bake in a 350 degree oven for 15 minutes or until the edges of the crust are starting to golden. You can also make the dough up a night or two in advance and store it in the fridge in an air tight container until you’re ready to use it. Really, don’t be intimidated. The crust comes together very quickly and the mess is minimal. I have tons of easy recipes on my site. Check them all out to help yo get dinner on the table! Transfer the dough to a floured service. Place each personal size dough on a cookie sheet (I like to cover the cookie sheet in parchment paper.) I like to use a pencil to leave the initial of each person so we know which pizza is which. 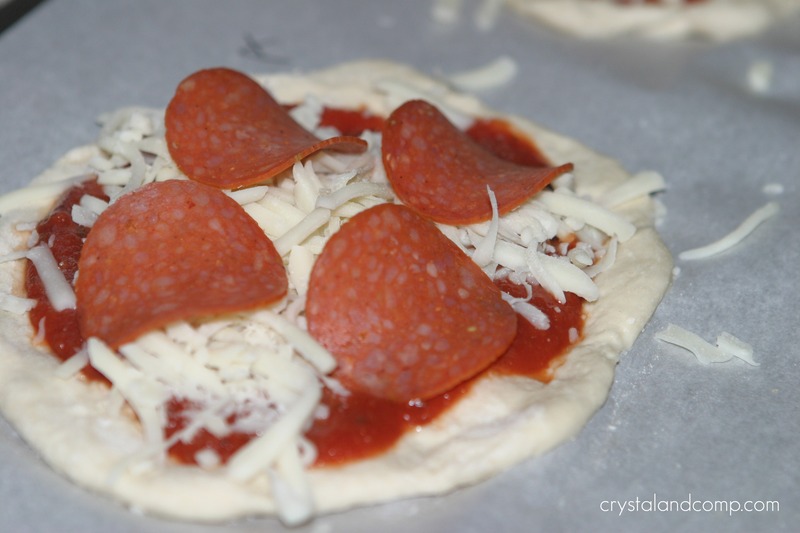 For the homemade pizza crust, I use the recipe on Fleischmann's website. great minds think alike! I just shared my recipe for pizza (that we also make into calzones) on monday. So easy, and the kids love making their own pizza. These look and sound great. I love the idea of the ‘personal’ size pizza. 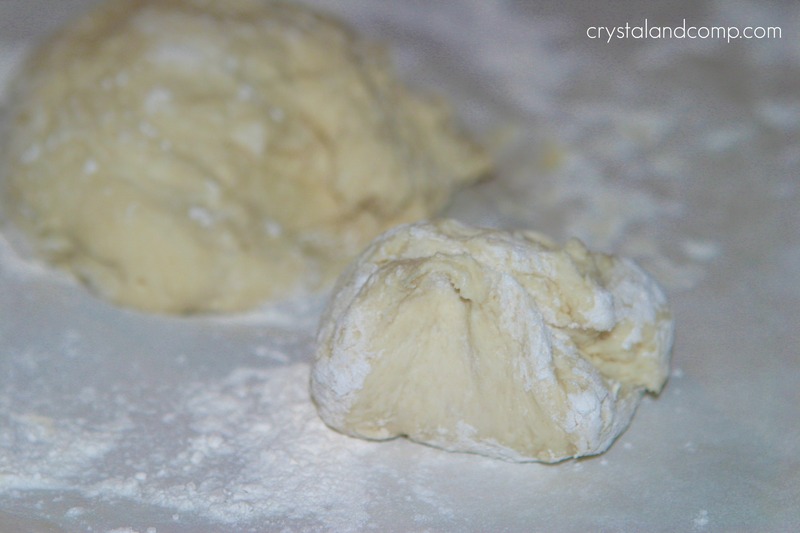 Come by to check out my easy pizza roll recipe. Similar and very easy. I know your kids will love it! Mmmm…we love homemade pizza sooo much at my house too! We are always making it with various toppings! Stephanie recently posted..My Version of The Chickpea Chocolate Chip Cookie – Our Families Favorite!